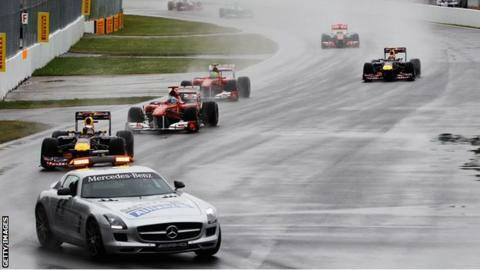 Formula 1 is to introduce standing re-starts following a safety-car period from next season. The move, intended to make place changes more likely at a re-start, is one of a series of rule changes introduced by governing body the FIA. Among them, the rules on noses will be changed to prevent the 'anteater' noses that predominate this season. Driver reaction to the re-start change was mixed when news of the plan leaked at last weekend's Austrian Grand Prix. Ferrari's Fernando Alonso said he had no strong opinions, while championship leader Nico Rosberg said it was "extreme". The Mercedes driver added: "I understand the start is one of the most exciting times for the fans but it sounds very extreme so I hope it's not going to be done. "It's going too far with things. I don't want to see such a huge change to do another start." F1 bosses feel that the current rolling starts behind a safety car do not provide sufficient excitement, because there is almost never any overtaking. A standing start increases the chances of drivers gaining or losing positions. The safety car will be retained to control the pace of the field while any accident damage is cleared because it provides a commercial benefit to F1 - Mercedes pay to provide the safety and medical cars. Red Bull's Daniel Ricciardo, who won this month's Canadian Grand Prix after a safety-car period, said: "Maybe (it will) be more exciting because there is a bit more variability. "But to me that's a bit too artificial because if you're a leader, say by 10 seconds, the safety car comes out, OK you lose your advantage, but at least you can still keep your position. "If it goes to a standing start, the chances of not-a-great start are pretty high so you could go from first to even fourth. "It's just a bit too much of a disadvantage for someone who earned the lead in the first place. "Now rolling starts are not too bad, at least it bunches everyone up. For spectators, a standing start would be better, yeah, but probably not the most fair idea." Others rule changes include tweaks to the number of tests and reductions in the allowed amount of research and development, both aimed at cutting costs. The three pre-season tests will have to take place in Europe, whereas until now teams could test further afield, and the number of in-season tests will be reduced from four two-day tests to two. Two of the permitted four days must be reserved for drivers with limited experience of F1, in order to make it easier the next generation of drivers. Among other cost-cutting plans, teams will be allowed to use only four engines per season, down from the current five, unless there are more than 20 races. The FIA said the changes to the nose rules would "ensure improved safety and provide more aesthetically pleasing structures". Many of this year's cars have narrow protuberances forward of the main nose structure to satisfy rules that were aimed at making the noses lower for safety reasons but in which teams found loopholes.